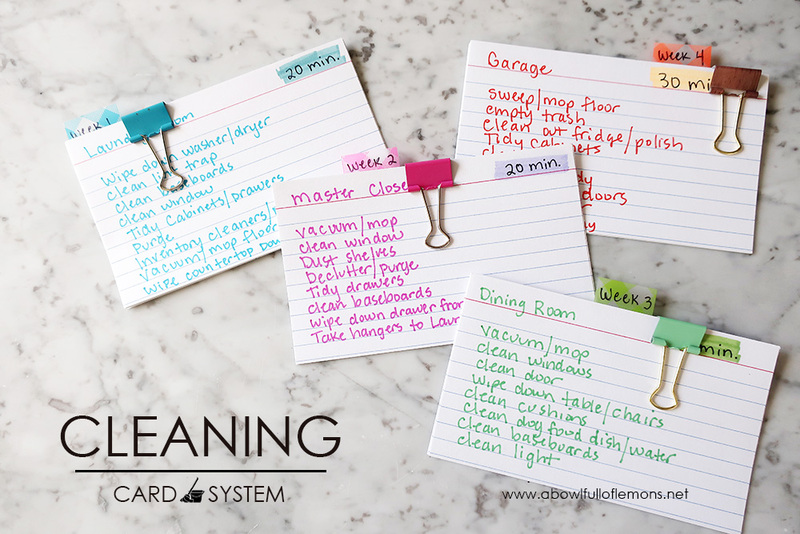 I shared a photo of my cleaning cards on Instagram a few weeks ago and thousands of you were interested in learning about the details. It’s really simple. There’s not much to it. 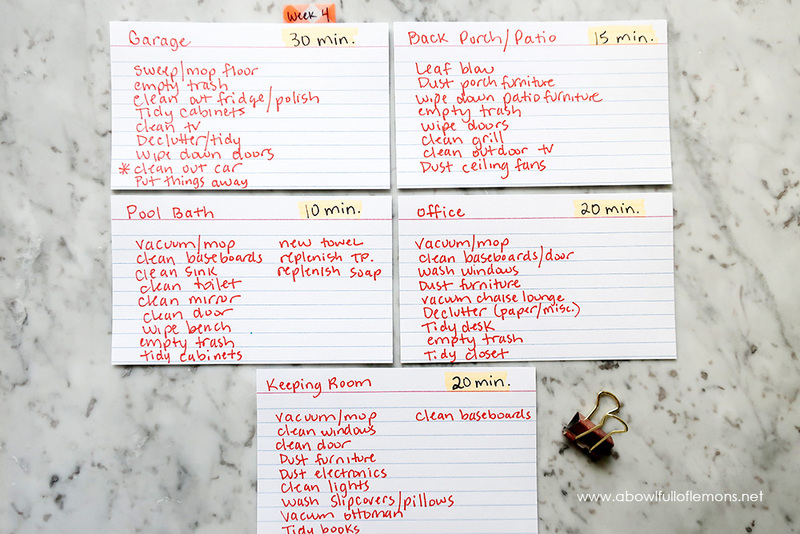 Keep reading to see how I stay on track with the chores of our home. I hope you take some inspiration from my system. When we moved into our new home, I quickly became overwhelmed with the square footage and the long list of chores that had to be done. It gave me immense anxiety and I wondered if I would have to hire a cleaning company to take over. 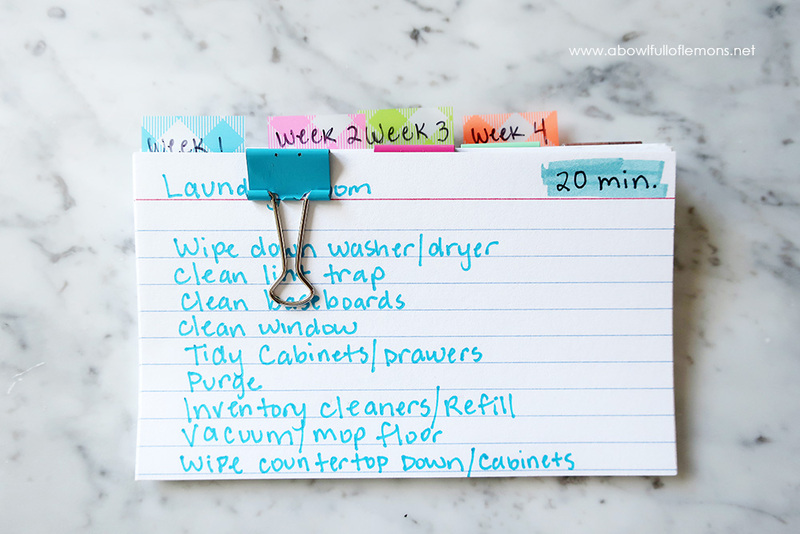 Instead, I came up with a simple system that allowed me to break the chores into manageable weekly tasks. Using 3×5″ index cards, I split up each room of our home. 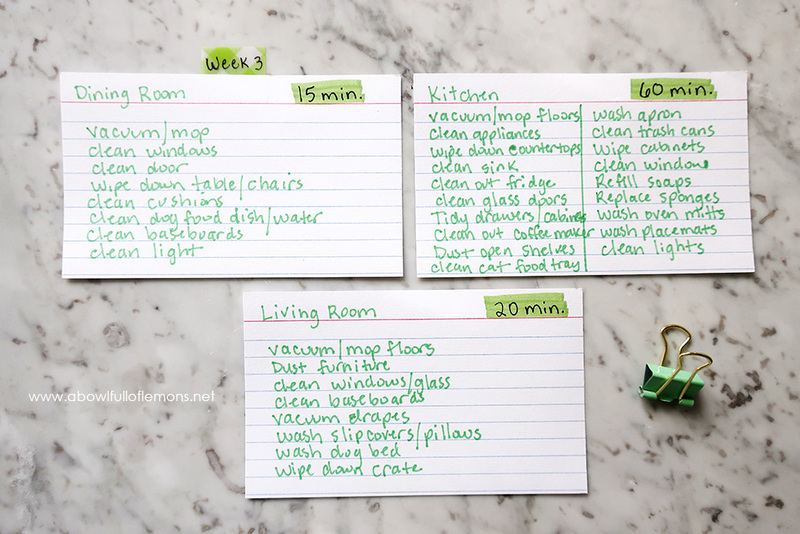 I wrote down one room on the top of each card and listed all of the tasks that needed to be completed in each space. Then I calculated how much time it would take me to clean each room and wrote it on the top of each card. 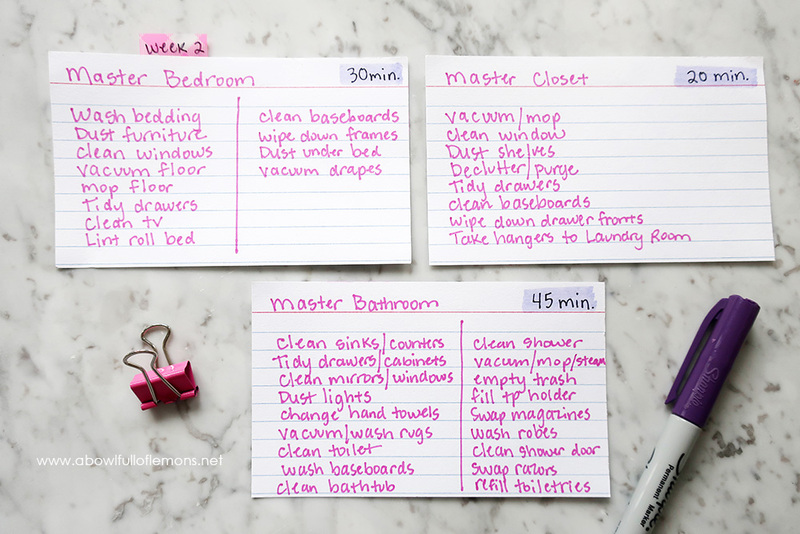 Knowing the time it would take to clean each room, I grouped them into weekly chores (3-4 rooms per week). It takes me an average of 95 minutes per week to clean 3-4 rooms. Here are my index cards. Yours will be different, but this is a guide to help you get started. You can find the tabs here. 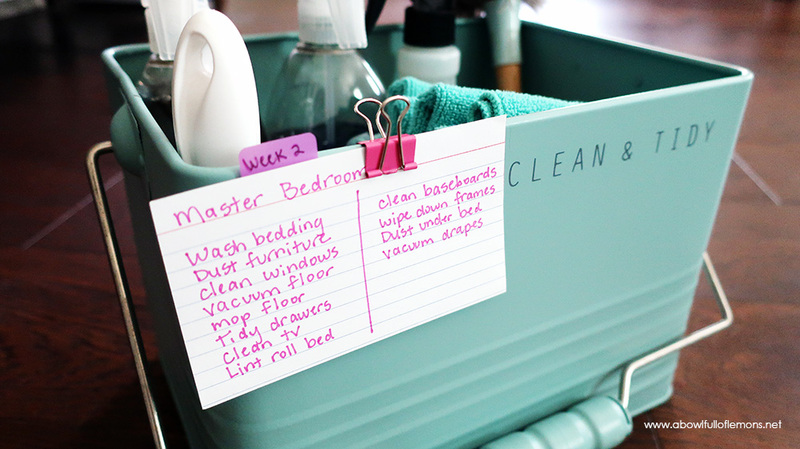 Once you are finished writing out your tasks on cards, you can store them in your cleaning caddy. Clip the current week on the side of the caddy, so it’s easy to see what needs to be done. (The cleaning caddy is from TJ Maxx). 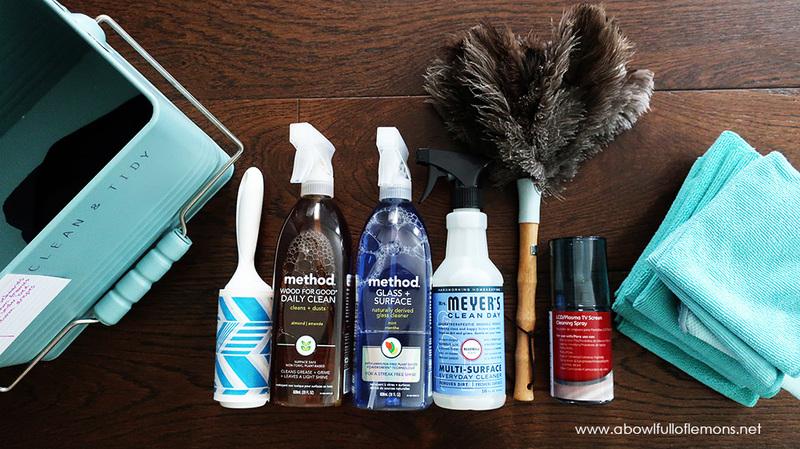 Here are some of my current favorite cleaning products. I got most of them at Grove Collaborative. If you are new to Grove, be sure to get your first set for free HERE. 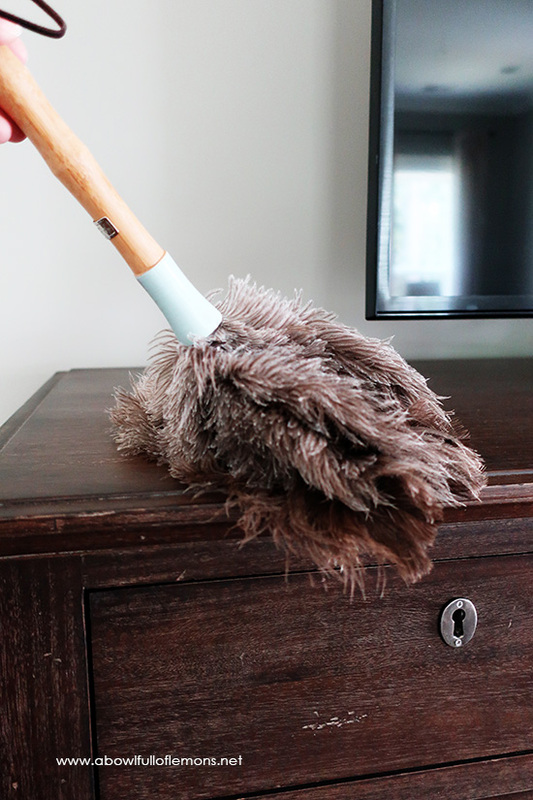 Don’t get overwhelmed with the thought of cleaning. Break it into daily tasks, and tackle them when you have time throughout the day. Finally, enjoy the process. You will be cleaning for the rest of your life, you might as well make it fun. If you would like to see my other cleaning checklists, be sure to check out my home keeping bundle. 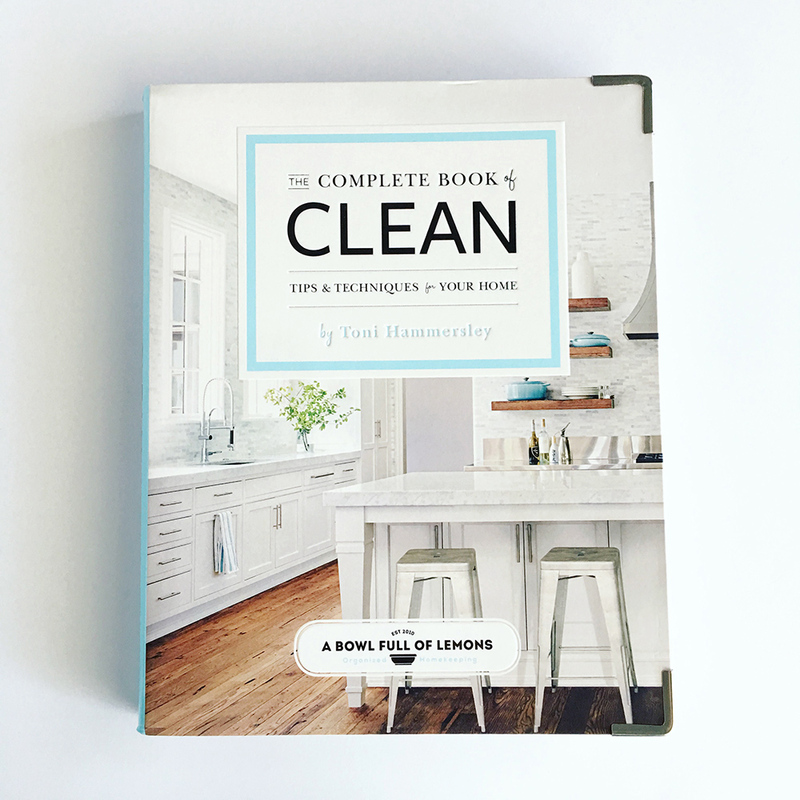 If you need more in depth help with cleaning and home keeping, check out my second book The Complete Book of Clean. 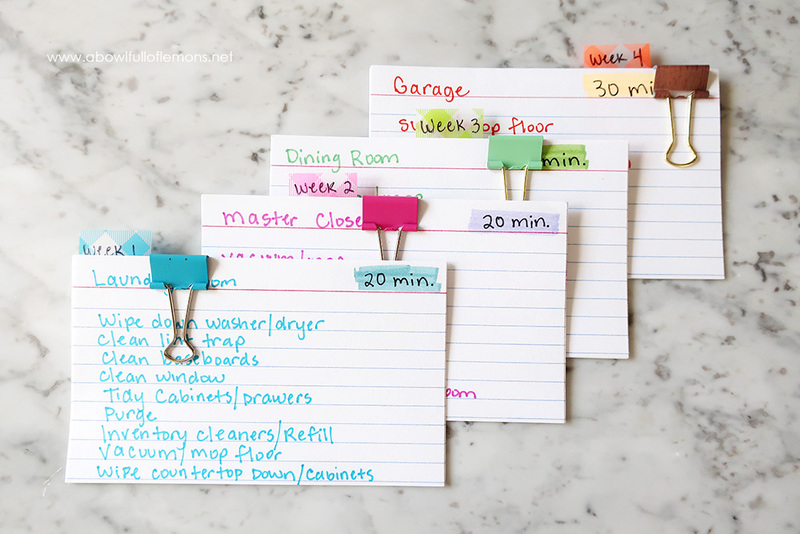 It has detailed cleaning checklists, cleaning recipes, and tips galore! Be sure to check it out here. Keep in mind that I maintenance clean on a daily and weekly basis. I sweep floors daily, wipe down counters, wash dishes, declutter, make beds, empty trash cans, clean toilets and tidy. 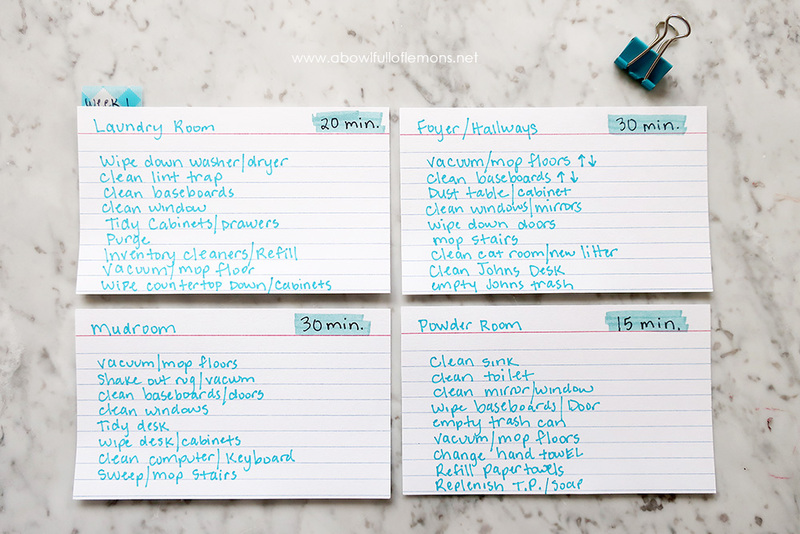 These cards fulfill the deep cleaning tasks that need done on a monthly basis. 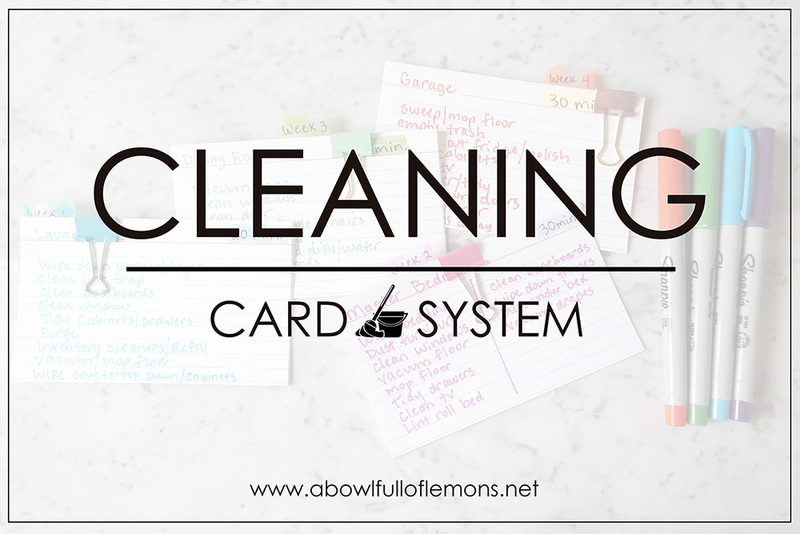 Let me know if this post has helped motivate you to start a cleaning card system! I love to hear your thoughts. 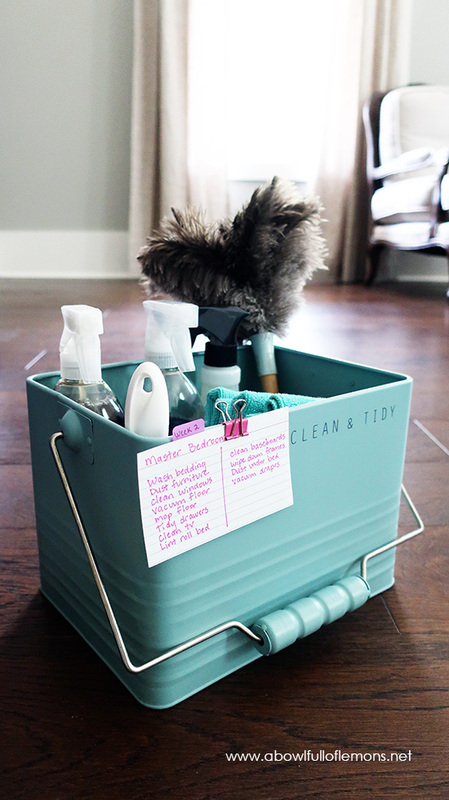 Be sure to check back next week, as I will be sharing my cleaning cabinet and laundry room organization with you! Get the most up to date information by subscribing to my blog here –> SUBSCRIBE.